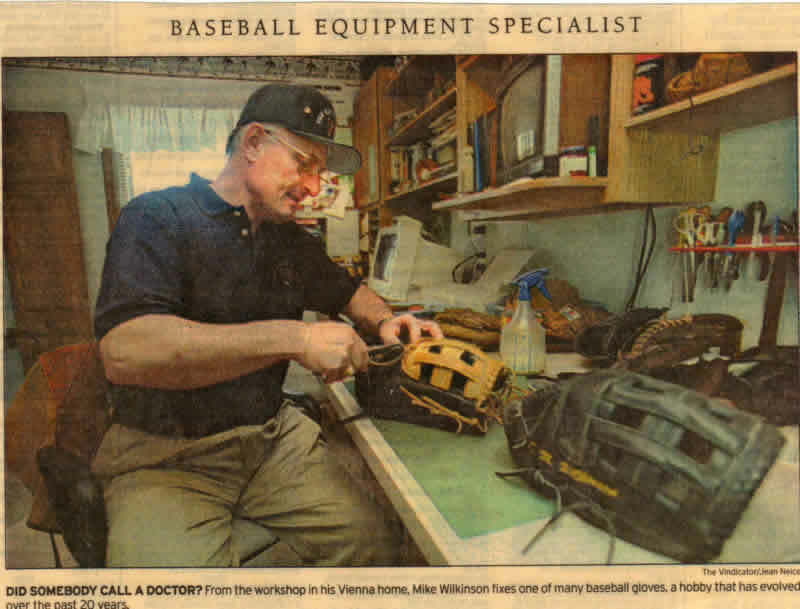 “GLOVE DOCTOR PRESCRIBES -- REPAIR AND RELACE” Michael Wilkinson has earned a beloved nickname during the past 20 years. There is a common bond between a kid and his old dusty baseball glove. But those boys grow up. And though the excitement of the mitt fades, the memory of great play with that old glove can linger for a lifetime. From his workshop in his Scoville Drive home, Michael Wilkinson keeps the memories and the gloves alive…. “it’s gotten to the point where I want to do this full time after retirement,” said the 53 year old Wilkinson. After retiring in 2002 as a Tool Engineer for 34 years, Mike has become “The Glove Doctor” full time with his wife, Barbara and son, Brant helping grow the business! Owner, Mike Wilkinson with experience gained over the past 30 years is able to re-lace, patch and sew, add padding, Velcro, replace straps and do just about anything that needs done to a glove to keep it serviceable. Due to time restraints, restoring old gloves is no longer done. Mike’s knowledge is self taught (with an engineering background) and from personal contact with designers and representatives of his glove manufacturers. Due to our being designated as the Wilson repair and warranty facility, the workload has increased significantly. Enough that the time required to keep up has reduced the time available to travel to tournaments causing us to cut back on travel. Also, at 67 years old it gets tough packing up and hauling all the gloves around and setting up and tearing down. Our shop is located in our home, and therefore we would appreciate not receiving calls until 10:00 am Eastern time. And for those customers who travel to our shop, please call for an appointment, as I may be traveling with the gloves, and our security team may react to unscheduled cars in the drive.